"Rhythm Medley" & "In The Garden Of Eden"
Clockwork is a vocal quartet who sing mostly close-harmony jazz but also our own twists on pop and rock tunes. Clockwork, an award-winning San Francisco based vocal ensemble with a signature sound and style, performs a banquet of music from funk to gospel and R&B to standards. Rooted in the tradition of great vocal jazz groups such as the Hi-Lo's and Lambert, Hendricks and Ross, the Clockwork "sound" draws inspiration from all styles. As the great Duke Ellington said, "If it sounds good, it is good." Experienced in both accompanied and a cappella performing, the group has arrangements for duos, trios and an 18-piece big band. 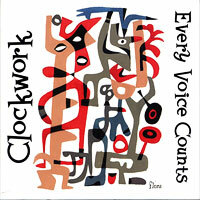 Members of Clockwork have performed live with artists such as Bobby McFerrin, The Hi-Lo's , Meredith Monk, Don Shelton, Gene Puerling, Barbara Lewis, Sufjan Stevens, John Zorn, Barbara Morrison, Kent Nagano with the Deutches Symphonie Orchester and the Berkeley Symphony Orchestra, The PM Singers, Heatwave, GQ, Barbara Lynn, Richie Cole, M-Pact!, the House Jacks, Boyz Nite Out, InFusion, Vocal Flight, and on Ward Swingle's Instructional video "Swingle Singing." The Bay Area's own mixed-voice jazz ensemble Clockwork, late of some tremendous performances as a quintet at the 2004 and 2006 Harmony Sweeps Finals, placing 2nd and 3rd, respectively, is now a quartet featuring Angie Doctor, John Paddock and Dave Duran, adding Juliet Green of another beloved Bay Area jazz group, +4db. "Every Voice Counts" is produced by Trist Ethan Curless and The Bobs' Richard Bob Greene, and it is lightly accompanied by various jazz artists on guitar, bass, drums, steel pans, flute, sax, cello, violin and electric violin. 12 songs, with some of our Clockwork favorites like "Rhode Island Is Famous For You" and Radiohead's "Creep;" "I Carry You Around/Chameleon," Jimmy Van Heusen/Johnny Mercers "I Thought About You," Yusef Islam's "Where Do the Children Play," the moody "Pontchartrain," the very funny, scattish "My Attorney Bernie," Charlie Parkers "Anthropology" and the traditional spiritual "The Water is Wide." Great stuff, and one thing is certain, we will always love listening to talented, soulful, jazzy Clockwork! Clockwork, 2004 Harmony Sweeps National Finals 1st runners up, is comprised of veteran San Francisco Bay Area harmony singers whose members have sung in several acclaimed a cappella groups. Two are founding members of Phil Mattson's PM Singers and Eric Freeman is the only singer to reach the National Finals in three different groups. Sophisticated jazz arrangements are a stand out on this EP including some complex harmonized bebop, the fabulous Brazilian classic " Corcovado" and a swinging Gershwin medley. This is smart, clever stuff! Bay Area favorite, 4-man, 1-woman vocal jazz group Clockwork surprised a strong field with a win in the 2004 Bay Area Regional, then went on to place 2nd in the National Finals, making many friends and new fans along the way. 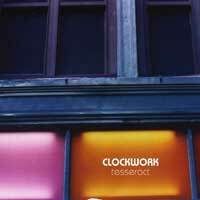 "Teseract" is Clockwork's debut CD (on PAC Records), produced by The Bobs' Richard Bob Greene. There are 11 songs, all with cutting-edge arrangements, particularly by group member Stephen Saxon (also including Greene and group members Angie Doctor and Jim Hale). Herbie Hancock's sassy "And (So) What If I Don't," (There's some nice alto sax on this one, otherwise "Teseract" is all a cappella), a cool, jazzy "My Baby Just Cares For Me," Lennon/McCartney's classic "Blackbird" (with actual Red-winged Blackbird sounds), and a rainy-day bluesy "DC Farewell." "Donna Lee" segues perfectly from the laid-back "Back Home Indiana" to Charley Parker's scattish, driving jazz standard, Radiohead's "Creep" runs the gamut from quiet to crazed, and jazz standard "Rhode Island Is Famous For You" features a bright, upbeat lead by Doctor. Clockwork nails John Coltrane's frantic, driving "Moment's Notice," slowing down with perfect control for Richard Rogers' moody "Little Girl Blue," and then taking off on some very nice vocal riffs on "Variation #1 on (J. Williams') 'Nightwatch" and finishing up with the con man's anthem, a bluesy, appropriately smarmy original by Jim Hale, "Big Cash Deal." We loved Clockwork live, and "Teseract" is poised, confident proof of their readiness to join a cappella's vocal jazz elite!